Authors: Jayaraman, S., Eswaramoorthy, S., Kumaran, D., Swaminathan, S.
Authors: Jayaraman, S., Eswarmoorthy, S., Ashraf, S.A., Smith, L.A., Swaminathan, S.
Cite: N-terminal helix reorients in recombinant C-fragment of Clostridium botulinum type B. 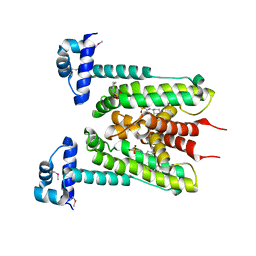 THE 1.7 ANGSTROM RESOLUTION CRYSTAL STRUCTURE OF AT2G44920, A PENTAPEPTIDE REPEAT PROTEIN FROM ARABIDOPSIS THALIANA THYLAKOID LUMEN. Authors: Ni, S., Mckgookey, M., Tinch, S.L., Jones, A.N., Jayaraman, S., Kennedy, M.A. 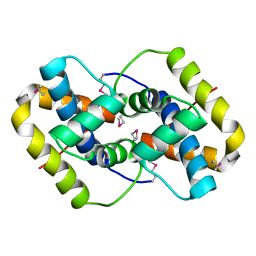 Cite: The 1.7 Angstrom resolution crystal structure of AT2G44920, a pentapeptide repeat protein from Arabidopsis thaliana thylakoid lumen. 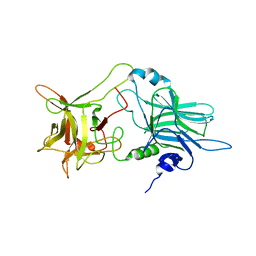 CRYSTAL STRUCTURE OF THE PUTATIVE COPPER HOMEOSTASIS PROTEIN CUTC FROM STREPTOCOCCUS AGALACTIAE, NORTHEAST STRUCURAL GENOMICS TARGET SAR15. 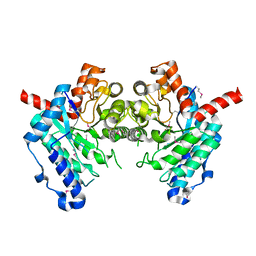 Cite: Crystal Structure of the Putative Copper Homeostasis Protein CutC from Streptococcus agalactiae, Northeast Strucural Genomics Target SaR15. X-RAY CRYSTAL STRUCTURE OF PHAGE-RELATED PROTEIN BB2244 FROM BORDETELLA BRONCHISEPTICA. NORTHEAST STRUCTURAL GENOMICS CONSORTIUM TARGET BOR24. 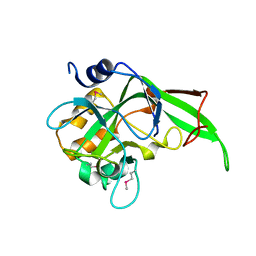 Cite: Crystal structure of Q8ZRJ2 from Salmonella typhimurium NESG TARGET STR65. 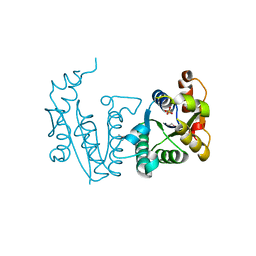 Cite: Crystal structure of YfmB from bacillus subtilis NESG TARGET SR324. 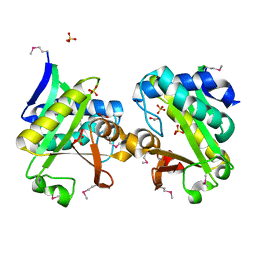 CRYSTAL STRUCTURE OF PUTATIVE 2-PYRONE-4,6-DICARBOXYLIC ACID HYDROLASE FROM PSEUDOMONAS PUTIDA, NORTHEAST STRUCTURAL GENOMICS TARGET PPR23. 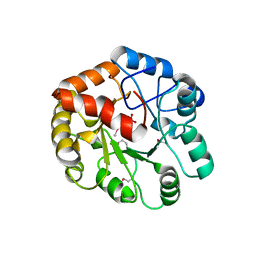 Cite: Crystal Structure of Putative 2-Pyrone-4,6-Dicarboxylic Acid Hydrolase from Pseudomonas putida, Northeast Structural Genomics Target PpR23. X-RAY CRYSTAL STRUCTURE OF PROTEIN SAV1430 FROM STAPHYLOCOCCUS AUREUS. NORTHEAST STRUCTURAL GENOMICS CONSORTIUM TARGET ZR18. Cite: Crystal Structure of the Hypothetical Protein SAV1430 from Staphylococcus aureus, Northeast Structural Genomics ZR18. 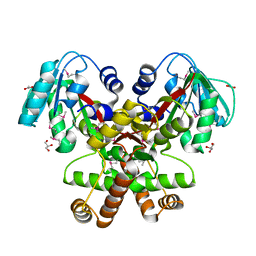 Cite: Crystal Structure of Succinylglutamate desuccinylase from Vibrio cholerae, Northeast Structural Genomics Target VcR20. 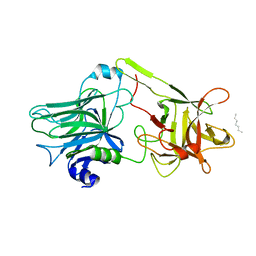 CRYSTAL STRUCTURE OF A PUTATIVE ACETYLTRANSFERASE FROM PYROCOCCUS HORIKOSHII, NORTHEAST STRUCTURAL GENOMICS TARGET JR32. 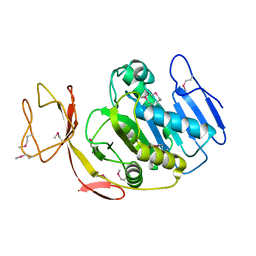 Cite: Crystal Structure of a Putative Acetyltransferase from Pyrococcus horikoshii, Northeast Structural Genomics Target JR32. 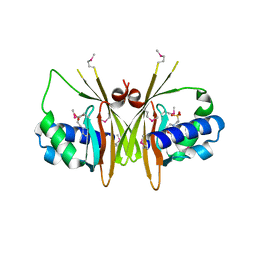 CRYSTAL STRUCTURE OF THE PUTATIVE SAM-DEPENDENT METHYLTRANSFERASE BC2162 FROM BACILLUS CEREUS, NORTHEAST STRUCTURAL GENOMICS TARGET BCR20. 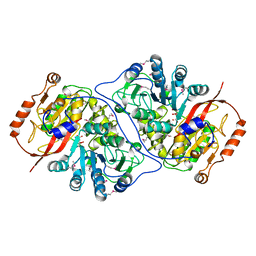 Cite: Crystal Structure of the putative SAM-dependent methyltransferase BC2162 from Bacillus cereus, Northeast Structural Genomics Target BcR20. 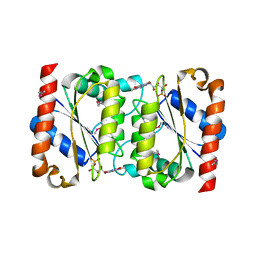 X-RAY CRYSTAL STRUCTURE OF PROTEIN FN1578 FROM FUSOBACTERIUM NUCLEATUM. NORTHEAST STRUCTURAL GENOMICS CONSORTIUM TARGET NR1. 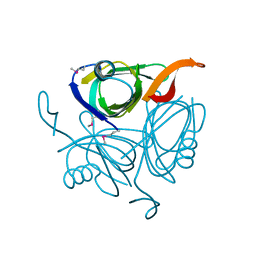 X-RAY CRYSTAL STRUCTURE OF PROTEIN YVFG FROM BACILLUS SUBTILIS. NORTHEAST STRUCTURAL GENOMICS CONSORTIUM TARGET SR478. 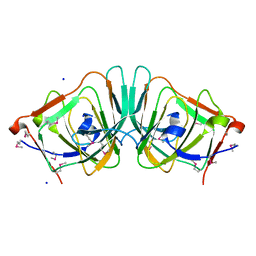 CRYSTAL STRUCTURE OF 4-OXALOMESACONATE HYDRATASE, LIGJ, FROM RHODOPSEUDOMONAS PALUSTRIS, NORTHEAST STRUCTURAL GENOMICS TARGET RPR66. 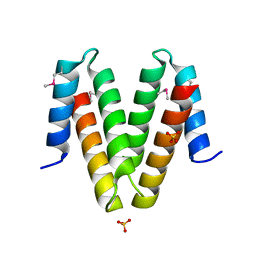 X-RAY CRYSTAL STRUCTURE OF PROTEIN YYBH FROM BACILLUS SUBTILIS. 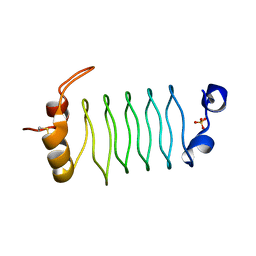 NORTHEAST STRUCTURAL GENOMICS CONSORTIUM TARGET SR506. 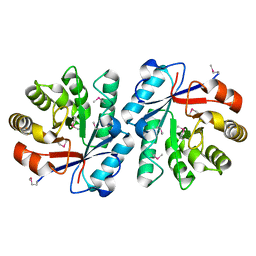 CRYSTAL STRUCTURE OF THE PUTATIVE ALFA SUBUNIT OF CITRATE LYASE IN COMPLEX WITH CITRATE FROM STREPTOCOCCUS MUTANS, NORTHEAST STRUCTURAL GENOMICS TARGET SMR12 . 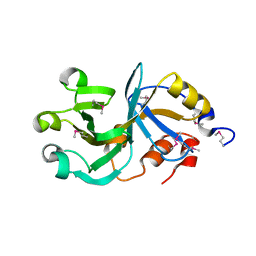 Cite: Crystal Structure of the Putative Alfa Subunit of Citrate Lyase in Complex with Citrate from Streptococcus mutans, Northeast Structural Genomics Target SmR12 (CASP Target). X-RAY CRYSTAL STRUCTURE OF PROTEIN DIP2367 FROM CORYNEBACTERIUM DIPHTHERIAE. 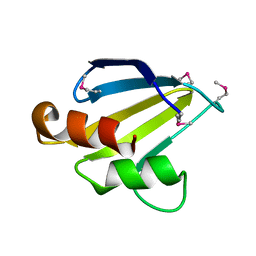 NORTHEAST STRUCTURAL GENOMICS CONSORTIUM TARGET CDR13. Cite: Three dimensional structure of conserved hypothetical protein from Corynebacterium diphtheriae at the resolution 1.9 A. 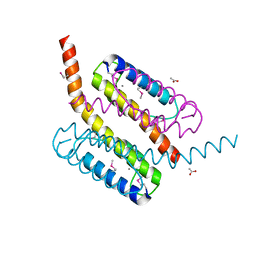 Northeast Structural Genomics Consortium target CdR13. 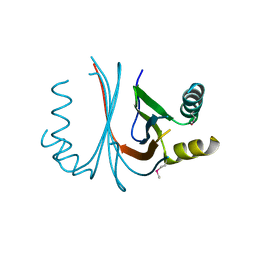 X-RAY STRUCTURE OF THE PROTEIN Q9KM02_VIBCH FROM VIBRIO CHOLERAE AT THE RESOLUTION 1.63 A. 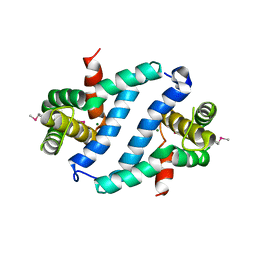 NORTHEAST STRUCTURAL GENOMICS CONSORTIUM TARGET VCR80. 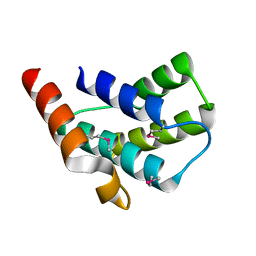 Cite: X-ray structure of the protein Q9KM02_VIBCH from Vibrio cholerae at the resolution 1.63 A. 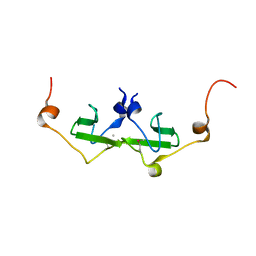 Cite: Crystal structure of the Q4KFT4_PSEF5 protein from Pseudomonas fluorescens.